Forged — Quenched and Tempered, with alloy pins. Sizes 1/2t-25t meet the performance requirements of EN13889:2003. 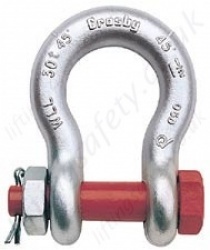 Shackles 55 metric tons and smaller can be furnished proof tested with certificates to designated standards, such as ABS, DNV, Lloyds, or other certification when requested at time of order. Type Approval and certification in accordance with ABS 2006 Steel Vessel Rules 1-1- 17.7, and ABS Guide for Certification of Cranes. 3.1 Certification as standard available for charpy and statistical proof test for pg 73 only up to 25 tons to DNV2.7-1 and EN13889. requirements of DNV rules for certification of lifting applications - Loose Gear. All other 2130 and all 2150 shackles can meet charpy requirements of 42 joules(31 ft-Lbs) avg at -20 degree C (-4 degree F) upon special request. NominalSize (in.) WorkingLoadLimit(t)* Stock No.